Yesterday, our Bill Charneski took off for Texas, where he will be making sure that our acquisition of Progressive Water Treatment wraps up quickly. Our New York auditors are on site. We think it's going very well. We remain on track for the October closing. We think we have company #2 lined up. But that's all I can say for now! LAX hotels aren't running their own hotel shuttles anymore! That is a classic outsourcing story. So let's say this happens at airports all over the country. Soon enough, someone is going to buy up all the local Shuttle Smarts! Then the USA will have one hotel shuttle service company. Think about it. That's exactly what's happening in the water business. Let's say you make electronic chips. These days, you don't want to worry about all the arsenic in your water... too much regulation, and it's not your core business. So, you outsource that problem to a service company that does the job much better than you could. The latest research confirms it: outsourcing is a reality in water treatment. Corporations all over the USA are outsourcing their water business to hundreds of local companies. Typically they're small — local or regional. Acquire the water service companies — acquire the water customer! 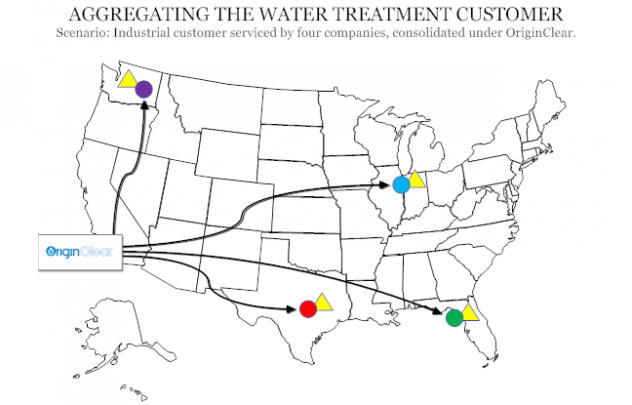 One corporate customer (yellow triangle), serviced by four regional service companies (circles), all potentially divisions of one company: OriginClear. Imagine, now, how this multiplies with numerous service companies and hundreds of water customers, all linked up under one national player. It's called the "network effect". And this is why, dear friend, we plan to aggregate the fragmented water services market, intending at least five acquisitions in the first two years of our three-year plan. Think about it! Even though we're acquiring water companies, it's all about the water customer.